Cat owners often claim that cats are too intelligent to do the sort of tricks that dogs do willingly. Others believe cats are unintelligent because it's harder to train them to do tricks. In this article I aim to explain some of these differences and explore feline intelligence and the limitations on feline intelligence. This also means looking at how cats see the world and at some aspects of natural cat behaviour. How do cats make decisions? For example when confronted in the wild with prey items of different nutritive value or where one might be easier or harder to catch? Most of us have seen cats standing indecisively on a doorstep, its tail twitching, apparently deciding whether to go out or stay in. Is it simply sniffing to see if anything interesting is happening in the neighbourhood or is it weighing up the various pros and cons of outside vs inside on a damp Tuesday morning? Object discrimination tasks have been used to investigate feline decision making. In one set of experiments, cats were presented with a pair of mismatched wooden blocks and rewarded intermittently for choosing a particular one. If only one block was rewarded, the cats rapidly learned to pick only to that block. If both were rewarded equally (50:50 ratio), the cats chose either block equally. If one block was rewarded 90% of the time (90:10 ratio), cats chose it all of the time, maximising the number of rewards they received. If the ratios became 60:40, 70:30 or 80:20 ratios, the cats generally matched the number of times the chose a block to the number of times it yielded a reward. The mechanism is actually very simple: most cats persevered in responding to the stimulus which had produced food on the previous attempt, only switching to the other when this prediction failed to pay off. Later experiments gave different results and it looks like "maximising" is a fall-back strategy. Also, in discrimination tests, the mistakes that cats made were often due to their initial preferences and aversions. Unlike monkeys, cats did not fully overcome these initial preferences or aversions. A cat's life is not simply reflex action or a series of either/or decisions. Cats often have to make decisions based on complex cues or on combined cues. A simple "if it is a furry animal, hunt it" response is not much good when the hunter is a domestic cat and the furry animal is a cow (though I am aware of one cat which did indeed hunt cows). Ecologically meaningful cues are generally complex and combine several attributes such as size, shape, brightness, colour, movement, sound and scent i.e. "is it a furry animal, in the right size range, can be safely tackled, does not taste bad?". This complexity is due to prey having camouflage or other strategies for avoiding predators. In testing, cats could discriminate between stimuli that differ in only one way e.g. either colour or shape, but what about more complex stimuli? In experiments to detect the most relevant of a pair of cues, 3 month old cats were trained to distinguish between rectangles that differed in both shape and brightness. They were then tested to see which one they preferred of pairs of rectangles that differed in either shape or brightness First they were trained to pick the left-hand figure in diagram (a horizontal, black rectangle). Then they were tested for preferences between the four pairs of objects show. Each pair differed in either shading or orientation (shape), but not both. The cats' choices (starred) showed they had learned that the rewarded object was both shaded and horizontal. Because both cues had been learned simultaneously by the cats, their accuracy varied, showing they didn't rely on brightness more than shape or vice versa. In contrast, rats tend to concentrate on either brightness or shape. Cats seem to pay great attention to whether figures are open or closed and learn to discriminate circles from U-shapes much more quickly than circles from triangles. The illustration shows types of shape that cats find easy or hard to discriminate from one another. Cats seem to consider the ratio between the area of a shape and the number of sides that it has. In a set of wooden triangles and circles that could be black or white, and large or small, cats learned that it was the shape that was important. They learned equally fast whether they were trained with pairs of triangles and circles that were always the same shade and size, or with pairs of triangles and circles that changed size and shape from session to session. Cats can be trained to prefer certain shapes, shades or patterns, but can they learn to pick "the odd one out"? This is the concept of "oddness" and chimps quickly learn to pick the odd one out when shown 3 objects where 2 objects are identical. Cats are less good at oddness; they take longer to learn the concept and are prone to making mistakes. 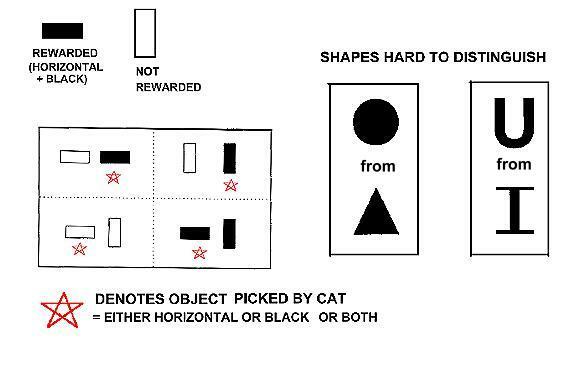 Five nine-month-old cats were trained (with food rewards) to pick the odd one out of 3 objects e.g. one triangle presented with 2 circles. As long as same objects were presented, they picked out the odd triangle. When this was changed to 2 triangles and a circle, the cats initially picked either of the 2 triangles, but soon picked the circle when that produced the reward. The reversal of "oddness" (which item was the odd one out) was repeated 20 times and the cats generally followed the change, though one cat proved to be a star pupil. The triangle/2 circles and circle/2 triangles combinations were then presented in a random order, and the star pupil learned that it was the odd one out, rather than a particular shape, that signalled food. This cat generalised the rule of oddness. It is possible that all of the cats understood oddness, but were less co-operative about demonstrating their abilities. Many creatures, ourselves included, learn through trial and error. They attempt a task and fail. Next time they are presented with the same task, if they have appropriate intelligence, they try a different approach. This sort of intelligence and learning is often tested using puzzles e.g. the animal must manipulate a puzzle-box to get at the food inside, or learns - through random trial - to press the correct lever(s). Both dogs and cats can be trained in this way, although cats respond less well to food rewards (an alternative is to make water the reward, but cats have gone several days without water before condescending to co-operate). Learning by observation is hotly debated with some researchers believing that watching another cat solve a task merely focuses a cat's attention on the problem to be solved, not on the solution. Although anthropocentric scientists argue that only humans and primates can learn through observing others, cat owners assert that cats can, to some extent, learn through observation as well as through trial and error. The term "copycat" is fairly accurate. Kittens learn hunting skills by observing their mother and attempting to copy her. Trial and error hones what they learn by observation. Or put it another way - observation tells them what to do and how it should be done, trial and error puts that knowledge into practice and hones their bodies. Other researchers argue that she simply creates situations which trigger and hone the kittens' innate responses. As they become more active, she takes prey back to the nest. At first she simply eats or shares it, but later on she takes live prey back for them to play with. At first, she recaptures the prey when it tries to escape and kills it if the kittens don't manage this themselves. Later on she leaves the kittens to kill the prey themselves and later still, they follow her when she goes hunting. If not familiar from your own cats, you will probably have seen TV documentaries about cheetahs showing this on a larger scale. Mother cats create situations in which the kittens can practise natural behaviours. Do mother cats also teach their kittens so that they learn from observation and later through copying? In laboratory experiments, 9-10 week old kittens watched an strange adult "demonstrator" cat wait for a flickering light to come on and then press a lever to get food. The kittens learned to perform the same task by watching the adult cat. A control group of kittens, which had not watched the demonstrator cat, did not learn to do the task, even after 30 days of trial and error. If the demonstrator cat was their own mother, the kittens learnt the light-lever-food trick in 4.5 days average (compared to 18 days average when watching a strange adult cat). The kittens whose mother demonstrated the trick took another 3.5 days to consistently press the lever on cue (compared to 14 days for the kittens watching a strange adult cat). Observing the other cat actually learn the skill had more effect than watching another cat perform a task it had previously learned. One factor which skews these results slightly is feline etiquette: kittens are naturally apprehensive of staring at unfamiliar cats. Feline etiquette dictates that staring is a sign of hostility, a rule waived when between kittens and mothers. The kittens could watch their mother more attentively without breaking instinctive rules of cat good manners. Some sceptical or anthropocentric researchers and behaviourists argue that all the kittens are learning is not to be afraid of the test apparatus and that the light-lever-food trick is learnt through trial and error by confident kittens. Watching their own mother would give them a greater degree of reassurance than watching a strange cat. Others, more generously suggest that, through watching another cat, the kittens learn there is some connection between the light, the lever and the food, but they have to learn the exact causal relationship through their own trial and error. It was also possible to deliberately mislead the kittens. Some kittens watched the demonstrator cat receive food when he walked up to the apparatus, but did not press the lever. These kittens found it harder to learn to press the lever compared to kittens that had not seen the misleading demonstration. Kittens tend to imitate their mother’s food selections as well. If she had been trained to eat an unusual food, such as banana or mashed potato, her weaning (5 week old) kittens learn to prefer this over meat pellets or more "natural" foods and this persists into later life (the "unusual" foods must be nutritionally supplemented). This is why it is important to provide a variety of foods to mothers and kittens - otherwise unhealthy or hard-to-accommodate food preferences will develop. Their imitation of mother's food preferences became most marked towards the end of the weaning period (7-8 weeks old). Adult cats can also learn through observation and can learn some skills faster by observing another cat performing them than by conventional (reward-driven) conditioning responses e.g. seeing a companion cat steal food from a kitchen counter or watching the owner open a door. Many cats have learnt how to get milk or food out of a container by using a paw; this is an adaptation of the cat's "fishing" instinct (the photos below are from pre-1910, long before Arthur the Kattomeat cat made the trick famous on TV!). There is anecdotal evidence that cats can learn by watching humans or other familiar animals such the pet dog that shares their home. Sacha Scofield [personal correspondence] presents an alternative view on feline learning after noticing a younger, shyer, less well socialised cat taking many of its behavioural cues from observing an older, more confident cat. She argues that observing another member of its species trying something new safely, and then being encouraged to imitate the action, could be considered an intelligent action (as it is in humans) rather than simple imitation. In the home environment, there are plenty of cats who have apparently learnt to use a lever-type door handle, to pull open a fridge door and to do several other tasks simply by watching the owner and then by trying it out for themselves. Are they learning through copying humans, are they merely losing their wariness of an object and becoming more willing to play with it or are they learning that there is some causal relationship (which they must work out for themselves) between the object and the goal? Having observed domestic cats in shelter settings and in the home, I am inclined to think that cats can learn, to some extent, through observing followed by trying things out. The inability to replicate this in the laboratory may be a case of not providing the right motivation for a non-humanlike, non-primatelike animal. Some cats do make the association between "doing something" with a simple handle and opening the door. They jump up at the handle and, trial and error-style, their weight alone does the work. Having accomplished the trick, they remember it. Trial and error is less plausible when the handle is a knob and trial-and-error never gets rewarded, but the cat still tries anyway. It is more likely that the cat has observed humans using the door-knob and made the association between the door-knob and the door opening. However, at least one pair of cats has learned to manipulate a round knob - one cat stood at the foot of the door with its companion standing on its back to work at the door-knob! The top cat could them manipulate the door knob with its front paws. It probably didn't understand the concept of turning the knob, but it knew that the knob was an important part of opening the door and it knew it needed to stand on something. It won't surprise cat owners to know that the cats were Orientals (closely related to Siamese cats). Jennifer Murray adopted a semi-feral tortie cat who learnt to open the refrigerator and pull back bolts by observing Jennifer, often after observing the action only once and then persevering if she didn't master it right away. This cat's repertoire included turning lights on and off to attract attention and turning on a tap (water faucet). She was also known to drag cans of cat from the cupboard towards the can opener and then start at Jennifer to hint that the can needed to be opened. She used her paws to pick up small objects or food morsels. She also learnt to bat a ball up a sloped floor so it came back towards her and to bat a ball hard against a wall to make it bounce back towards her. Similarly, some cats have learnt to carry balls up a set of stairs then knock it so it can be chased down the stairs, caught at the bottom and carried back up to repeat the game. Jennifer was vegetarian and this cat quickly worked out that the most acceptable type of prey was leaves and sometimes fruit or vegetables from neighbouring gardens, for example a pear or cucumber. Because Jennifer accepted these gifts, this behaviour was positively reinforced. When a non-vegetarian moved into the household, after seeing him eat chicken on his first evening, the cat switched to hunting mice and chipmunks which were always presented to him and not to the vegetarian member of the household. The vegetarian gifts came to an end at that point, perhaps as she saw this person as a more apt pupil! There are sometimes claims of "Counting Cats" that perform arithmetic. Usually the owner is giving the cat a signal - sometimes without even realising this e.g. a facial muscle movement - and the cat is responding to that signal in expectation of a reward. In some cases, the owner hasn't realised s/he is training the cat and attributes the counting ability to an unusual degree of intelligence. Researchers consider that cats have some kind of abstract conception of numbers up to a count of about seven. It is claimed that mother cats can count up to six or seven though three or four is most likely. This is based on the theory that she notices if a kitten has gone missing and sets out to look for it. In all likelihood, she recognises her kittens by their scent signatures and realises that a particular scent signature is missing. While kittens are tiny, they probably don't yet have individual smells. Their mother might be attuned to the sounds they make - sounds too high for the human ear to hear - or indeed she might have some idea of "one missing", a sense of "wrongness". I am prepared to give cats the benefit of the doubt on this, at least as far as small numbers are concerned though . At a cat shelter I have sometimes had to sneak motherless kittens into a litter of same age kittens. I have done this while the mother is being distracted and I've made sure the smells are thoroughly mixed and masked by my own scents (since the mother already knew me and already accepted my scent on her kittens). In some cases I have seen the mother taking stock of the kittens and obviously aware that the number of kittens now present was not the same as before. Sometimes she seemed to "count them" several times, either visually or by sniffing or both, and still seemed perplexed that the head count was wrong in spite of the smells being right - a concept of "too many". I get regular emails about Cuty Boy the alleged feline mathematician. Cuty Boy is a much publicised cream Persian from Bar Dubai whose alleged passion and talent for arithmetic was discovered when he was a kitten. It is claimed that he can add, divide, multiply, subtract, find square roots and solve algebra problems. Cuty Boy was bought from a Dubai pet shop by Hema Mohan Chandra, from Kerala, who is also his stage handler. Her son, Renjit, noticed Cuty Boy's ability to understand commands. Hema claims the cat can indicate "yes", "no", "left" and "right" and that he replied "yes" when asked if he understood numbers. She then taught him to count up to 20. Cuty Boy gives his answers by nose-bumping her face the correct number of times. Numbers too large for nose-bumping are indicated using a set of answer cards. The cat selects the correct answer by twitching his tail and looking at the card. To convince sceptics of Cuty Boy's abilities, the owners had him tested by maths teacher Sahadevan Panicker from Dubai's Gulf Modern School. Unfortunately, Cuty Boy has to be pushed by his family to perform in public. But what is really happening? The phenomenon is called involuntary/unconscious cuing. Some cats are adept at reading human body language even if the humans are not aware they are transmitting body language. Studies of "counting horses" (who tapped a hoof the correct number of times in response to an arithmetic puzzle) uncovered the truth. The animals picked up on almost imperceptible twitches from the handler/trainer. The handler was mentally urging the animal to tap again and get the right answer. This mental urging leaked into a facial or body twitch and at each "signal", the horse tapped a hoof. In some cases, the handler was unaware that he was leaking signals to the horse (this may also be true of Cuty Boy's owner). The studies found that when the body language was obscured, or when a the animal worked with an unfamiliar handler, the animal lost its ability to count. When the handler didn't know the answer (or was deliberately given an incorrect answer by the person setting a complex problem), the counting animal also got the answer wrong. Set pieces such as selecting the correct card were learnt in much the same way - picking up on tiny signals, including "left" and "right". Cuty Boy also understands phrases in 8 languages, including Gujarati, Persian, Malayalam (Hema's mother tongue), English, Arabic and French and can identify objects when asked in those languages. This is not evidence of great linguistic skills or of a psychic cat. While the meanings of some of those words will have been learnt, Cuty Boy will be relying on his owner's involuntary cues regardless of the spoken language. Counting, linguistic and psychic animals do not perform well in controlled conditions. Owners blame this on the animal being upset and refusing to co-operate, but the truth is that the animal is not being given any cues. Cuty Boy's unwillingness to perform in public is probably linked to difficulty in concentrating on the owner's signals when there are so many distractions for both cat and owner. In a public environment, there is greater tension and this makes the owner's body language unclear. In spite of recent relentless publicity, Cuty Boy is not a mathematical prodigy. He is simply a performing animal with a flair for reading body language and doing a counting trick that was debunked over a century ago. He is the 21st Century version of "Clever Hans". Note: The most famous counting critter was William von Osten's horse, Clever Hans (Kluge Hans), in Berlin. Hans answered tricky maths questions (including fractions) by tapping out the answer with his hoof. He was first publicly exhibited in 1891 and several scientists became convinced that there was no signalling or trickery. They were impressed that Hans performed almost as well without von Osten as with him. In 1904, psychologist Oskar Pfungst studied Hans and noticed that if the nobody present knew the correct answer, neither did Hans. When the horse wore blinkers to obscure his view or when the questioner was further away, Hans got the answer wrong. He deduced that Hans was getting a signal from the person asking the question. Pfungst noticed that when a person asked a question, they tilted their head slightly without even realising it. This signalled Hans to begin tapping. When Hans got to the right answer, the excited questioner lifted their head, raised an eyebrow or smiled ... and Hans stopped counting! Hans was clever because he could read human body language. Another example was Lady Wonder the "telepathic horse" tested by JB Rhine. In 1927, Lady Wonder was seen to knock over alphabet blocks in response to questions. Two years later, Lady Wonder failed testing and Rhine concluded that the horse had lost its psychic abilities. Like Clever Hans, Lady Wonder had previously been picking up on subtle human body language. Cuty Boy is simply a feline equivalent of Clever Hans. 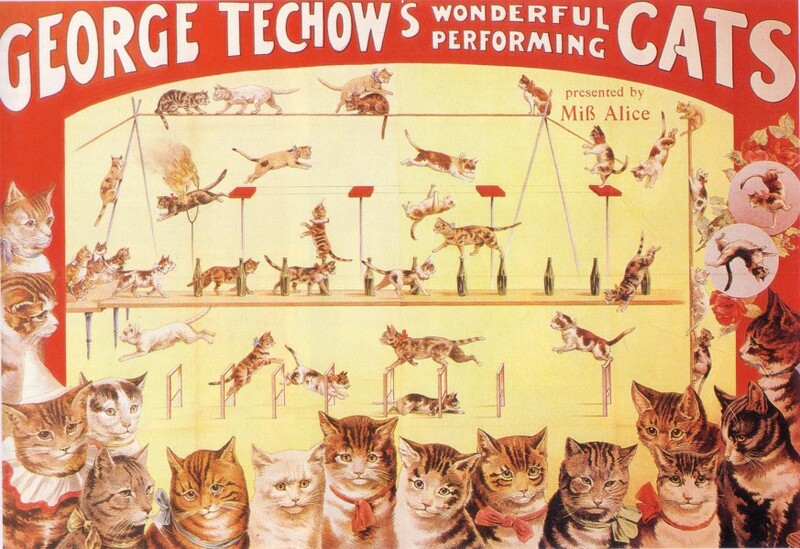 Many owners believe cats can't or won't learn to do tricks. You have only to watch the cats (the real ones, not the CGI ones) on cat food ads and in movies to realise this is not true. Cats have learnt to jump through hoops, jump from one stool to another and to fetch objects and drop them in a box. A relative's cat learned to fetch a toy of his own choice from his toybox when his elderly owner gave the instruction for play-time (this also kept the floor tidy). Other cats have learnt how to eat food after dipping a paw into a half-full can of cat food, while other cats have learnt this "trick" unaided (pawing food from a container is similar to scooping fish or prizing a mouse from a crevice). The sudden vogue in "clicker training" is for cats as well as dogs. When teaching cats tricks, the most effective procedure is one that animal trainers call "shaping" and which is used with wild animals. You must break down the teaching process into small incremental steps, where each step is easily mastered. Because cats are easily demotivated, the training session must be set up so the cat has a very high probability of doing the right thing. To start with, you look for something a cat does naturally and which can be shaped into the desired behaviour. Victoria Voith described how a cat was taught to jump over a fly swatter using the stepwise approach. At first, the cat was rewarded for walking over a fly swatter placed on the ground. Once it associated the fly swatter with a food reward, the swatter was held a few inches from the floor and the cat encouraged to step over it for the reward. Each time the cat mastered the new development, the fly swatter was raised until he had to jump over it. Use a hoop instead of a fly swatter and the trick looks even more impressive! Similarly, to teach a cat to jump from stool to stool, first it learns to step from one stool to the next. Over a period of time, the stools are moved further apart until eventually the cat has to jump from one to the other. The same cat learnt to shake hands and even to roll over on command, tricks normally associated with dogs. Learning to roll over was broken down into steps which got "right first time" and earned the reward. Initially he learnt to lie down when gently pressed between the shoulder blades, something many cats will do naturally (but not all, so be careful if you try this at home!). The pressing became gentler and gentler until it was just a touch and later just a hand signal. The hand signal was paired with a voice command and after many repetitions, the cat responded to the voice command with no need for any hand signal at all. Once he learnt the lie down command, the trainer gently rolled him over and rewarded him only when he was turned on his back. This was repeated over and over using gentler pushes each time until the cat lay down and rolled over in one move at the voice command. Each time a new step is introduced, the cat must choose whether to do the additional step and get the reward or whether to stick to the old routine and miss out on a reward. Because the steps are small and the shift is gradual, the cat doesn't have a chance to get frustrated or to make too many wrong choices. Cats have learnt some very complex tricks in this way and one Russian trainer has a whole stage act where cats leap, walk along parallel bars and even "walk" upside down beneath a pole (wild margays do this on tree branches so it is a natural feline behaviour albeit one not often seen in domestic cats). They walk on their hindlegs and even do handstands - balancing on their forelegs on their trainer's hand. Just like dogs, cats (and their big cat relatives) have been taught to jump through fiery hoops and balance on rolling cylinders. If anything, the cat's greater agility and their retractile claws allows them to do tricks that dogs cannot do. As scientific researchers have discovered, the trick is finding a way to motivate a cat to perform tricks or tests on command. Other tricks pet owners have taught their cats include drinking from a beaker held between the front paws and eating using short chopsticks fastened to a front paw. One helpful trick small hand-reared kittens sometimes learn is to lie on their backs, sucking from a feeding bottle propped on their hind-legs legs and hugged by their front legs! In the USA, cat agility classes are taking off at some shows in a similar way to dog agility classes and many cats are showing that they enjoy jumping through hoops just as much as dogs do (some cats go round a second time - without the owner - just for the fun of it). Once a cat has learnt a trick, he must learn that he won't get a reward every single time. Eventually he will only get an occasional reward, but intermittently rewarded behaviours are better retained than taking the rewards away in one step. This way the cat learns a general rule of "do this trick and I might get a reward" and he keeps on performing, rather than thinking the rules of the game have suddenly changed in which case he will not want to play any more. One trick which several cat owners have taught their pets is how to use the human toilet. I have seen several "how to" articles on this and several devices (mostly round litter trays which slot under the toilet seat) to aid the process. Animal behaviourist and vet Benjamin Hart described one method in his books and articles; articles and adverts in cat magazines describe similar methods. They all depend on gradually modifying the cat's normal litter tray habits. One or two cats bypass the training altogether and use the toilet without prompting and at the other end of the scale, some cats are too wary of the toilet to learn to use it consistently. First the cat learns to use its litter tray next to the toilet. Then, over a period of time, the litter tray is raised up to the level of the toilet seat so the cat gets used to being above ground level. Then the tray is placed on the toilet lid until the cat gets used to being on the toilet itself. Then it learns to use the actual toilet. A popular method is to fix a shallow litter pan underneath the toilet seat, or to attach a sheet of waxed cardboard under the seat using wires. Over time the litter is gradually removed and parts of the litter tray are cut away until finally the entire bottom of the litter tray is removed. This is where the commercial training set is useful as you just need to pull pieces out of slots to create the holes, otherwise a stiff cardboard tray is needed and there is the risk of it becoming soggy and giving way under the cat's weight. Like a child's training seat, usually you start with a circular central hole which increases in diameter. By the time the litter pan has holes in it, the cat will normally have learnt to perch on the toilet seat itself, not least because the litter pan feels unsteady. Most cats will slip off the seat and into the toilet bowl at least once and will need re-training to restore their confidence. Tool use is associated with primates and some birds, but J Justin Lancaster, PhD, believes he has witnessed tool use in a domestic cat in San Diego in 1996. He witnessed a grey domestic longhair called Sasha using an absorbent hair scrunchy to moisten her kibble (dry cat food). The scrunchies, belonging to his daughter, were kept in a drawer which Sasha learnt to open by standing on the worktop above the drawer. Sasha hooked the scrunchy with a claw, put it into her mouth and carried it into the kitchen. Sasha deliberately dropped the absorbent scrunchy into her water bowl and dabbed it with her paw. She then fished it out and dropped it onto her kibble. She then ate the kibble that had been moistened by the wet scrunchy. The repeated retrieval and use of a scrunchy as a sponge to make kibble more palatable qualifies as tool use. Sasha, adopted as a kitten in 1988, died in 2005. Jennifer Murray, who witnessed learning through observation in one of her cats, now has another tortie cat, this time a feline magpie who stores toys and small stolen items such as paper money of bottle caps. This cat likes to put objects into other objects or specific locations for example toys are placed in shoes or added to the hoard in the linen closet. She also likes fishing toys out of bags (this is a natural behaviour) so Jennifer put toys into freezer bags to indulge this behaviour. She enjoyed chasing the whole bag of toys rather than each toy individually and this progressed through fetching plastic bags to be filled then to putting toys in the bag and fetching the filled bag - making her possibly the only "tool-using" cat to use a bag to carry several toys at once! When the food bowl is empty, she will retrieve an empty cat food bag from the recycling container and take it to Jennifer as a hint that food is required. As well as associating the bag with a full foodbowl, the smell of of cat food would have attracted her to the empty bag and she already knew that fetching items to Jennifer results in a positive outcome. Again the cat's behaviour is positively reinforced if the food bowl is filled. No wonder owners sometimes feel they are being trained by their cats. Messybeast would be interested in hearing about other tool-using cats. So do cats think? They don't think in the human sense of the term, but (apart from some hard-wired reflexes) they perform mental processing on incoming information and make decisions on how to act. They have an internal representation of the physical world, they comprehend certain physical laws (that objects don't cease to exist when out of sight), they have a good sense of time, they can identify other cats, a number of humans and a range of objects. These are the sort of things most humans do without conscious effort. Intelligence is defined by human beings and is judged against human abilities. Children learn to look where someone is pointing. With cats, if you point at an object, your cat looks at your finger, not at where your finger is pointing. To attract a cat's attention to an object, you have to tap the object itself. One measure of intelligence is self-awareness. The test for self-awareness is to see how an animal reacts to its own reflection. Humans and higher primates recognise their own image in a mirror. If you put some paint powder on a child's nose or a chimp's face and let it look in a mirror, the child or chimp will rub the blob on its own face, not the mirror. Cats first check behind the mirror for the strange cat, but soon learn that the mirror cat is not real and ignore it (learning to ignore it is necessary, otherwise its own reflection in a puddle might stop the cat from drinking). Unlike humans and higher primates, they do not appear to understand that the mirror cat is itself. Sacha Scofield [personal correspondence] suggests an alternative view on feline self awareness. She suggests that the mirror test does not accommodate the different mindsets of social and non-social subjects. The supposition is that cats lose interest in their reflection in the mirror because it appears to be another cat which doesn't interact with the subject. Sacha believes that cats understand mirrors to be reflections of the real world, and that they will use mirrors to observe objects that that are out of their line of sight. Sacha has observed her own cats apparently watching each other, and watching their owner, via a mirror. In some cases, the cat has met the eyes of its owner in the reflection and meowed a greeting, demonstrating recognition of the image. After moving house, the older cat (15 year old Flossy) used the mirror more frequently to observe other household members. She can see from the lounge to the bedroom and vice versa using the mirror. She also uses it to observe me in bed, usually when she wants attention. She seems the use the mirror to compensate for her deafness i.. being detecting whether another cat is approaching from behind. To test whether a cat properly understands a mirror would involve sitting a cat in front of a mirror and the researcher standing behind it. Does the cat respond to the researcher's reflected gestures, or does it turn round and respond to the researcher? Because the cat may also react to sounds made by the researcher while gesturing, this is harder to assess. Sacha proposes that cats are uninterested in their own image because they are not interested in their own external appearance. Animals that recognise their own reflections, such as humans, monkeys and parrots, are social animals whose mating and social opportunities rely on their physical attractiveness to other members their species. Humans with little interest in hierarchy or social interaction often have a correspondingly low interest in their own appearance (conversely, there are plenty of stereotypes of "vain" mirror-gazing men and women). Feline hierarchy, such as it is, is based on fitness and prowess and not on attractiveness. Unlike visually oriented species such as humans, monkeys and parrots, cats perceive the world through a mix of sound, scent, touch (whiskers) and sight. They are more adept at seeing movement patterns than static objects. She argues that even if the cat recognises its own reflected image, as a non-social animal it may simply lack the motivation to react to any changes in its own appearance viewed in the mirror. In "The Feeling of What Happens: Body and Emotion in the Making of Consciousness" neurologist Antonio Damasio claims that the neurological structures of consciousness/self-awareness are present in all mammals. It recognises the similarities in mammalian brains. This is one of relatively few explanations of consciousness based on actual neurological evidence. Just because a cat is considered (by classical science) not self-aware, does not make it non-intelligent. Feline intelligence is geared to the cat's ecological niche and is constrained by physical limitations and by innate behaviours. Those innate behaviours are hard-wired into the brain for survival reasons and to free up thinking areas of the brain. In its lifetime, your cat hones its innate behaviours and learns many things that evolution did not anticipate - opening doors, mastering cat flaps, tricks (if you have the time and patience), recognising the sound of your car engine and waking you up at a set time each morning. Like humans, many elderly cats suffer a decrease in cognitive functions. This is termed "senility" or "senile dementia". In the wild, cats rarely live long enough for this condition to become advanced. Cats with senility would not survive - owners of senile cats report them to be forgetful, prone to wandering and getting lost and unaware of danger. They often need to be reminded to eat and may lie outdoors in inclement weather. Hygiene and housetraining are also forgotten. Even in the absence of other dangers, senile cats would succumb to self-neglect. Researchers at the universities of Edinburgh, St Andrews, Bristol and California found that this senility is a feline form of Alzheimer's disease. Previous research identified thick, gritty plaques on the outside of elderly cats' brain cells, similar to those found in humans with dementia. Studies identified a key protein that can cause mental deterioration comparable to human Alzheimer's sufferers. The cat's shorter lifespan makes it easier for scientists to see how the condition develops. The cat's shorter lifespan, compared to humans, means the effects of diet, high blood pressure and prescribed drugs can be assessed. Good diet, mental stimulation and companionship reduces the risk of dementia in both humans and cats. Readers should be warned that some of the following references include accounts of distasteful experiments involving surgical mutilation of cats and/or implantation of electrodes into their brains. Messybeast.com does not support such experiments, but leaves readers to make their own choice of further reading. Adamec, Robert E. "The Interaction of Hunger and Prey in the Domestic Cat (Felis catus): An Adaptive Hierarchy?" Behavioural Biology 18 (1976): 263 - 72. Adler, H E " Some Factors Of Observation Learning In Cats". Journal of Genetic Psychology, 86 (1955): 159-77. Blake, Randolph. "Cats Perceive Biological Motion" Psychological Science 4 (1993): 54 - 57. Caro, T M, and M D Hauser. "Is There Teaching in Nonhuman Animals?" Quarterly Review of Biology 67 (1992): 151 - 74. Chesler, Phyllis. "Maternal Influence in Learning by Observation in Kittens" Science 166 (1969): 901 - 903. Davis, Joel L, and Robert A Jensen. "The Development of Passive and Active Avoidance Learning in the Cat" Developmental Psychobiology 9 (1976): 175 - 179. Dumas, Claude. "Object Permanence in Cats (Felis catus): An Ecological Approach to the Study of Invisible Displacements" Journal of Comparative Psychology 106 (1992): 404 - 410. Dumas, Claude, and François Y Doré. "Cognitive Development in Kittens (Felis catus): An Observational Study of Object Permanence and Sensorimotor Intelligence" Journal of Comparative Psychology 105 (1991): 357 - 365. Fiset, Sylvain, and François Y Doré. "Spatial Encoding in Domestic Cats (Felis catus)" Journal of Experimental Psychology: Animal Behaviour Processes 22 (1996): 420 - 437. Harrison, Jean, and Jennifer Buchwald. "Eyeblink Conditioning Deficits in the Old Cat" Neurobiology of Aging 4 (1983): 45 - 51. Hart, Benjamin L "Learning Ability in Cats" Feline Practice s(s): 10 - 12 (September—October 1975). Heishman, Miriam, Mindy Conant and Robert Pasnak. "Human Analog Tests of the Sixth Stage of Object Permanence" Perceptual and Motor Skills 80 (1995): 1059 - 68. Herbert, M J & Harsh C M "Observational Learning by cats" Journal of Comparative Psychology. 37 (1944): 81 - 95. John, E R, P Chesler, F Bartlett and I Victor. 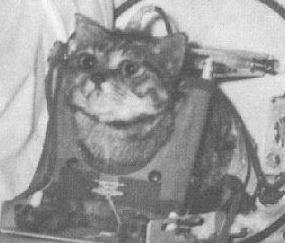 "Observation Learning in Cats" Science 159 (1968): 1589 - 1591. Kukorelli, Tibor, and Laszlo Detari. "Effects of Viscerosensory Stimulation on Hypothalamically Elicited Predatory Behaviour in Cats" Physiology & Behaviour 55 (1994): 705 - 710. Leveque, Nancy W "Cognitive Dysfunction in Dogs, Cats an Alzheimer’s-like Disease" Journal of the American Veterinary Medical Association 212 (1998): 1351. Loop, Michael S, C Leigh Millican and Shari R Thomas. "Photopic Spectral Sensitivity of the Cat . "Journal of Physiology 382 (1987): 537 - 553. Oniani, T N, N D Lortkipanidze and L M Maisuradze. "Interaction Between Learning and Paradoxical Sleep in Cats" Neuroscience and Behavioural Physiology 17 (1987): 304 - 310. Osthaus B, Lea SE, Slater AM. 2005. Dogs (Canis lupus familiaris) fail to show understanding of means-end connections in a string-pulling task. Anim Cogn 8(1): 37-47. Pallaud, B "Hypotheses On Mechanisms Underlying Observational Learning In Animals" Behavioural Processes, 9 (1984): 381 - 394. Pfungst, O. (1907). "Das Pferd des Herrn von Osten (Der Kluge Hans). Ein Beitrag zur experimentellen Tier- und Menschen-Psychologie". Leipzig: Johann Ambrosius Barth. (English translation by C.L. Rahn, prefaced by J.R. Angell: as Pfungst, O. (1911). "Clever Hans (The Horse of Mr. Von Osten). A Contribution to Experimental Animal and Human Psychology". New York: Henry Holt. Rosenkilde, Carl E, and Ivan Divac. "Discrimination of Time Intervals in Cats" Acta Neurobiologiae Experimentalis 36 (1976): 311- 317. Sherk, Helen, and Garth A Fowler. "Optic Flow and the Visual Guidance of Locomotion in the Cat" International Review of Neurobiology 44 (2000): 141- 170. Voith, Victoria L "You, Too, Can Teach a Cat Tricks (Examples of Shaping, Second-Order Reinforcement, and Constraints on Learning)" Modern Veterinary Practice, August 1981: 639 - 642. Warren, J M, and Alan Barron. "The Formation of Learning Sets by Cats" Journal of Comparative and Physiological Psychology 49 (1956): 227 - 231.